April 3, 2014; Nathan Berry, the Leading Sydney jockey, has died in hospital after being struck down by illness in Singapore and SYDNEY’S racing fraternity is in mourning following the death at age of 23. Berry was struck down with suspected viral encephalitis but later diagnosed with the much more serious illness the Norse syndrome, an acute condition related to epilepsy. He was placed in an induced coma last week and although he made some improvement according to the news, by Tuesday his condition had worsened and soon died. Berry had married Whitney Schofield -the daughter of leading jockey Glyn Schofield, just two months ago. This is supposed to be one of the most exciting weeks on the Sydney calendar for their expected winning on the running of Golden Slipper on April 4, 2014 but it turns out as one of the saddest week for everyone supporting him. He won on the Gold Coast in January as the Magic Millions Two-Year-Old Classic aboard Unencumbered which was the biggest win of his short career. 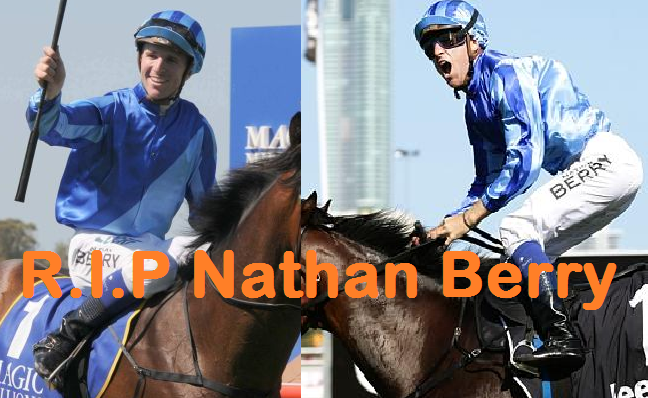 We gives condolences to Nathan Berry's family and friends in-behalf of the this blog authors. Rest in Peace Nathan Berry..